Yes, Maria-Elena is a friend of mine, and a fellow Los Angeles Roadrunner (training program for the Los Angeles Marathon). She was appointed to the El Monte Union High School Governing Board of Trustees a couple of weeks ago, replacing a Trustee who resigned under a cloud of corruption. Here is an earlier piece. 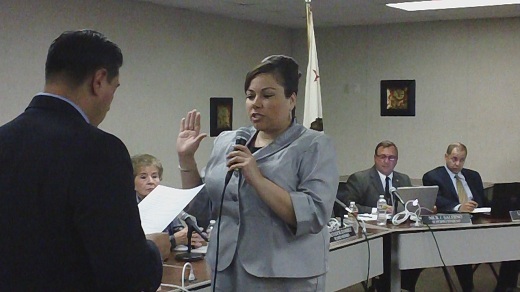 After a public interview and selection process, the El Monte Union High School District Board of Trustees selected educator Maria-Elena Talamantes to replace former board member John Tran, who pleaded guilty Tuesday to federal bribery charges. The board had operated one member short for more than a month following Tran’s resignation in early February. Talamantes is a special education teacher at Baldwin Park Unified School District’s Margaret Heath Elementary School. Before becoming a teacher four years ago, Talamantes spent nine years reviewing contracts and payroll documents as an auditor in the Teamsters Union, she said. The 14-year El Monte resident was selected out of a pool of nine candidates. Maria-Elena will make a good Trustee. My only regret in this whole affair is that she may not make many of those long 10-12 mile runs this spring/summer.